"This isn't about the merits of protecting salmon, we all agree on that," said McMorris Rodgers. The U.S. House of Representatives has narrowly passed a bill, opposed by the Governors of Washington and Oregon, that would curtail spill over Columbia and Snake River dams that speeds migration of young salmon to sea. The legislation would also prevent any breaching of four Army Corps of Engineers dams on the Snake River, which stand in the way of salmon migration to and from spawning habitat on such wild streams as Idaho's Salmon River. Idaho's late Gov. Cecil Andrus once summed up the controversy with a suggested bumper sticker: "Idaho: Has Habitat, Needs Fish." The legislation is a brainchild of Washington Republican Reps. Cathy McMorris Rodgers and Dan Newhouse. McMorris Rodgers is facing a tough reelection race against Democratic challenger Lisa Brown, until recently chancellor of Washington State University-Spokane. "This isn't about the merits of protecting salmon, we all agree on that," said McMorris Rodgers. "This is about providing certainty and letting experts and scientists in the region, who know the river best, work collaboratively to meet that goal." Oregon Gov. Kate Brown urged the House to reject the spill bill. "I am concerned this legislation would thwart federal court direction to provide additional spill at dams on the lower Columbia and Snake Rivers, and the collaborative state, tribal and federal process that has worked effectively to develop spill provisions for 2018,"
The legislation would freeze in place a Federal Columbia River Biological Opinion, issued in 2014, for recovery of salmon in the Northwest's greatest river system. But U.S. District Court Judge Michael Simon has ruled that the opinion does not do enough to rebuild endangered salmon and steelhead populations. Judge Simon has required the Army Corps of Engineers to spill more water, in what is known as the "fish flush" at eight Columbia and Snake River dams. Slack water in reservoirs has brought as much as a six-fold increase in the time it takes young salmon to reach the Pacific. The federal Bonneville Power Administration, which markets electricity from federal dams on the river system, has long sought to undermine the "fish flush." Water sent over dam spillways, instead of through turbines, costs money in lost sale of power to the Southwest. The federal government has offered a succession of plans for recovery of salmon, covered under the Endangered Species Act. The plans have failed to pass muster with federal judges overseeing a prolonged battle that pits commercial and sports fisheries against industrial, agribusiness and barge transportation interests that have long dominated the river. Washington Gov. Jay Inslee has argued that the House bill would damage "ongoing efforts to improve future salmon and dam management." "I am committed to preserving the benefits of our hydropower dams in a manner that is in balance with protecting and restoring salmon," Inslee said in a letter to House leaders. Judge Simon has directed a new environmental review of the river system, which is required to include consideration of breaching the four Snake River dams. Defending the Snake River dams has become a cherished political cause for Republicans. Soon-to-be President George W. Bush, at a 2000 Spokane rally, committed a verbal blooper pledging to maintain dams on "the river on the Snake." 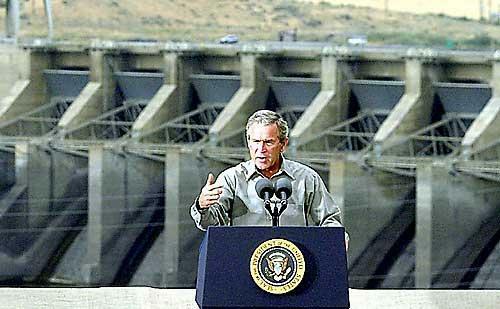 Bush would visit Ice Harbor Dam, outside Pasco, during one year when salmon runs showed signs of recovery. McMorris Rodgers has chained herself to the dam issue since first being elected to Congress in 2004. A group of utilities, ports and agribusiness interests, called Northwest RiverPartners, has latched onto lost power sales in arguing for the legislation. "Utility customers can't afford more rate hikes whle the court experiments with operating the federal hydrosystem and potentially harms young salmon migrating downstream in the process," said Terry Flores, executive director of Northwest RiverPartners. But environmental and fisheries groups have warned that curtailing the spill could have disastrous consequences for the remaining -- and endangered -- salmon runs of the Columbia-Snake River system. Joe Kawahara, a commercial fisherman from Quilcene, accused bill sponsors of "pitting Northwest fishers and farmers against each other. We're both food producers, our communities and our businesses are both important. "We expect our elected officials to bring people together and work on solutions -- such as the Klamath Basin Settlement and the recently former Columbia Basin Partnership. But instead, we get this divisive bill that locks in failure and conflict. It will have a devastating effect on salmon and our region's salmon-fishing sector." The legislation goes to the U.S. Senate, where it has yet to pick up support from Washington, Oregon or California senators.